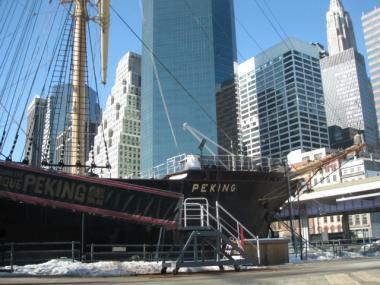 The Seaport Museum New York is moving closer to a plan for recovery. The city is working with the museum to replace President Mary Pelzer and members of the board of directors, in the hope that new blood will buoy the organization, sources said. A museum spokesman released a statement Monday confirming the management changes, though without specifics. "Seaport Museum New York has been involved in ongoing conversations with the city to develop a transition strategy that includes a plan for financial sustainability and new leadership," the museum's statement said. "The priority is to ensure that visitors will be able to experience New York's dynamic waterfront history for years to come." The attorney general's office is encouraging the Seaport Museum not to get rid of its three working historic ships, including the schooner Lettie G. Howard. Peter Stanford, who founded the museum in 1967 and is leading a grassroots movement to keep it open, said he was heartened by the city's actions. "We're feeling very optimistic and hopeful," said Stanford, who no longer has an official role in the museum. "The city is doing the right thing so far. We now have a great opportunity — let's not fall short." Stanford said he recently heard another good piece of news: that State Attorney General Eric Schneiderman has intervened to encourage the museum not to get rid of its three working historic vessels. The museum had planned to either sell the ships or loan them out to other institutions this year, but Schneiderman's office is urging the museum to keep the ships in New York Harbor, Stanford and another source said. The attorney general's office oversees nonprofits and a source said the office got involved in this case to protect the museum's assets. 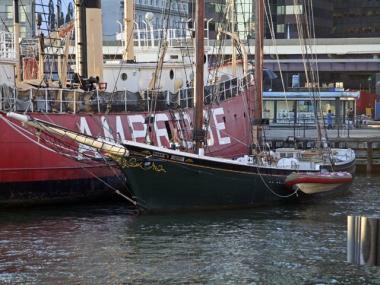 While the three working historic boats — schooners Pioneer and Lettie G. Howard and tugboat W.O. Decker — require some repairs, they could easily bring in money through educational programs and private charters if the museum fixes them up, Stanford said. Stanford's Save Our Seaport group, which includes many of the museum's former employees and volunteers, has been advocating for the museum to refocus on waterfront programming, which had lagged in recent years. Stanford said the city is still working out who will manage the historic boats, but he heard that the Museum of the City of New York may help run the landside operation of the museum's galleries, at least temporarily. The attorney general's office declined to comment. The city's Department of Cultural Affairs and the Museum of the City of New York did not immediately respond to requests for comment. 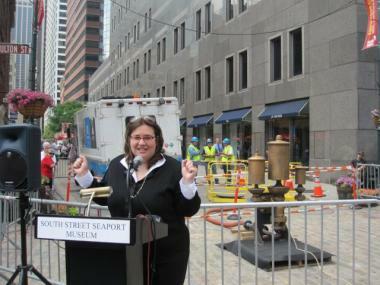 Mary Pelzer, president of the Seaport Museum New York, shown at an event last year, will be removed from the helm of the museum, sources said. Save Our Seaport plans to hold a rally at the Seaport May 22 at 2 p.m., in support of the leadership changes and of the boats remaining in New York Harbor. Community Board 1's Seaport/Civic Center Committee will discuss the museum's future at a meeting May 17 at 6 p.m., 49-51 Chambers St., seventh floor.